Gus: We would like to introduce you to our new foster - Mercedes! Mercedes was thrown out of a moving car. Someone rolled down their window and just tossed her out. I just don't understand humans some times! Luckily, a Good Samaritan saw this happen and stopped to help her. They took her to Great Plains SPCA where the vet staff checked her out. She was very fortunate she wasn't hurt. The shelter called us to see if we would accept her as a student. Of course, we said yes! 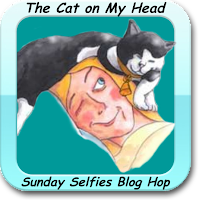 For her first Sunday Selfie Blog Hop, the Mama wanted to do one of those cute baby photo-shoots. To say Mercedes is an active kitten is a bit of an understatement. The Mama swears she never sleeps! It just shows you what a fighter she is! With all that "tortitude", she's going to keep fighting until she finds her forever family! Update on the Beatles Kittens: All the kittens except George have been adopted! Paula and Ringo even went home together. Have a great life, John, Paula and Ringo! George, you'll find your family soon. Hang in there, buddy! 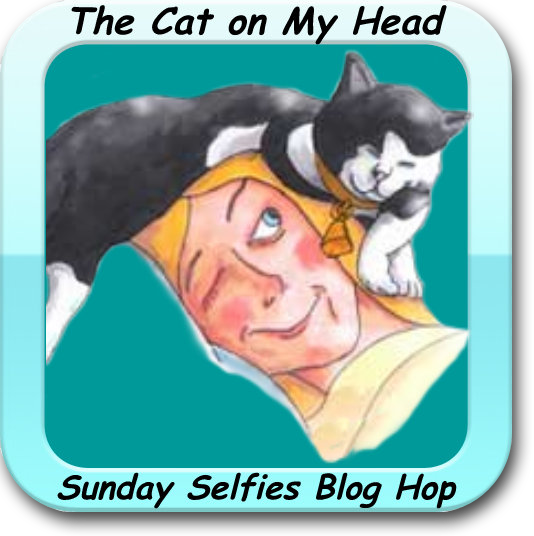 Mercedes is joining The Cat on My Head's Sunday Selfie Blog Hop. Please hop on over to see the other entries! No. We aren't sure what kind of car she was thrown out of. We decided to name her Mercedes because she deserves a life of luxury. Plus, she is now back on the road but this time it is towards a forever family. Poor beautiful baby! It is heartbreaking to think someone could do such a thing. I am glad she didn't suffer any injuries and hope she soon gets her forever home. She is so beautiful. Thank goodness she wasn't hurt. She needs someone who will love and adore her. awwwwwww Mercedes, you sure ARE a fighter! Too bad we can't track down that nasty human - our mom would have a few words or ten, and some of them might even be HBO words!! How could you stop at 16 photos! Honestly, she's soooo cute! More More More!!! Such a sweetie, I know she will head home soon and the driver of that car will meet Karma soon. I just don't understand how cruel and heartless some humans can be. What a precious little angel she is. That is so sad. I am glad she wasn't hurt though and will have a forever home soon. Bless her sweet little heart and bless you for fostering her. She's precious - I'm sure she has a great FOREVER in her future! It's hard to imagine someone tossing a kitten out a window but humans can be horribly cruel sometimes. We also hope that little George gets his FOREVER soon as well and happy to hear the others are in their new homes. What a beauty ! Enjoy your time with her, for she will have a forever home soon ! Purrs to George - you'll get one too ! We cannot believe the cruelness of some humans. Thank cod Mercedes was rescued and now can find the purrfect home. Good grief! Can't believe it!! There are some arrogant, stupid, evil and plan nasty people in the world. We took John home! He is the sweetest cat ever. He loves our boys and has made best friends with our dog. They are inseparable! Thanks for adopting John. I am so happy he is doing well! I'd love to get updates as he gets older! Awwww Mercedes mew are a furry special little kitty and so lucky too. We don't understand how peeps can be so cruel and heartless, let's hope that karma sorts them out asap.